Add moving water and a unique look to your water feature using the Pentair PRO Series Model 4000 Pond Pump. This durable and versatile pump easily moves up to 1022 gallons of water per hour throughout your pond, and is perfect for powering statuary, creating a small waterfall, or adding a fountain to your water with its included accessories. The plastic casing forms a hardy item, while its low profile allows it to rest in a pond or skimmer inconspicuously. The corrosion resistant bearings, improved shaft design, and combined rotors create a durable impeller, for an energy efficient unit which still moves plenty of water. Attach the included, large foam prefilter to the threaded inlet when using this pump submerged, protecting the impeller from any pond debris. Remove the prefilter and add 1" fittings to the inlet for use inline instead, bringing great versatility to your setup. A bevy of risers, spray heads, and other fittings can also be added to the pump's outlet, for you to create a fountain in moments. The two different spray heads offer exciting fountain patterns, and an included tube with diverter valves allows you to direct some water to a different accent. Its cover removes easily for maintenance, and the 20' cord offers a wealth of placement options. 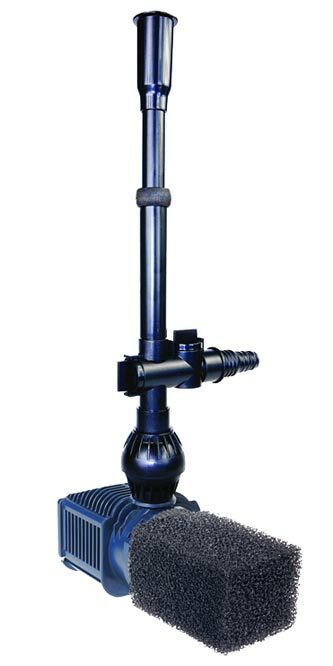 Power a fountain or lovely statue in your pond with this PRO Series Model 4000 Pond Pump. Three year limited warranty. Use this chart to determine the proper size pump for your pond. The distance that water travels both vertically and horizontally in tubing is called the Head Height. Gallons Per Hour (GPH) represents the maximum amount of water your pump is capable of pushing at a given Head Height. To ensure the pump's best possible performance, reduce frictional losses by using the largest diameter hose possible. Availability: 3 in Stock. Ships from OH within 24 business hours , 3 available at this price!